Not to be confused with Borium. Bohrium is a chemical element with symbol Bh and atomic number 107. 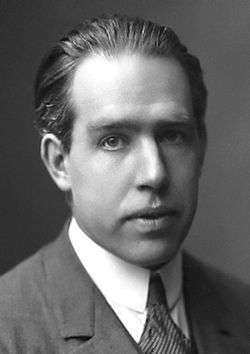 It is named after Danish physicist Niels Bohr. It is a synthetic element (an element that can be created in a laboratory but is not found in nature) and radioactive; the most stable known isotope, 270Bh, has a half-life of approximately 61 seconds. In the periodic table of the elements, it is a d-block transactinide element. It is a member of the 7th period and belongs to the group 7 elements as the fifth member of the 6d series of transition metals. Chemistry experiments have confirmed that bohrium behaves as the heavier homologue to rhenium in group 7. The chemical properties of bohrium are characterized only partly, but they compare well with the chemistry of the other group 7 elements. Element 107 was originally proposed to be named after Niels Bohr, a Danish nuclear physicist, with the name nielsbohrium (Ns). This name was later changed by IUPAC to bohrium (Bh). Two groups claimed discovery of the element. Evidence of bohrium was first reported in 1976 by a Russian research team led by Yuri Oganessian, in which targets of bismuth-209 and lead-208 were bombarded with accelerated nuclei of chromium-54 and manganese-58 respectively. Two activities, one with a half-life of one to two milliseconds, and the other with an approximately five-second half-life, were seen. Since the ratio of the intensities of these two activities was constant throughout the experiment, it was proposed that the first was from the isotope bohrium-261 and that the second was from its daughter dubnium-257. Later, the dubnium isotope was corrected to dubnium-258, which indeed has a five-second half-life (dubnium-257 has a one-second half-life); however, the half-life observed for its parent is much shorter than the half-lives later observed in the definitive discovery of bohrium at Darmstadt in 1981. The IUPAC/IUPAP Transfermium Working Group (TWG) concluded that while dubnium-258 was probably seen in this experiment, the evidence for the production of its parent bohrium-262 was not convincing enough. This discovery was further substantiated by their detailed measurements of the alpha decay chain of the produced bohrium atoms to previously known isotopes of fermium and californium. The IUPAC/IUPAP Transfermium Working Group (TWG) recognised the GSI collaboration as official discoverers in their 1992 report. The German group suggested the name nielsbohrium with symbol Ns to honor the Danish physicist Niels Bohr. The Soviet scientists at the Joint Institute for Nuclear Research in Dubna, Russia had suggested this name be given to element 105 (which was finally called dubnium) and the German team wished to recognise both Bohr and the fact that the Dubna team had been the first to propose the cold fusion reaction to solve the controversial problem of the naming of element 105. The Dubna team agreed with the German group's naming proposal for element 107. There was an element naming controversy as to what the elements from 104 to 106 were to be called; the IUPAC adopted unnilseptium (symbol Uns) as a temporary, systematic element name for this element. In 1994 a committee of IUPAC recommended that element 107 be named bohrium, not nielsbohrium, since there was no precedence for using a scientist's complete name in the naming of an element. This was opposed by the discoverers as there was some concern that the name might be confused with boron and in particular the distinguishing of the names of their respective oxyanions, bohrate and borate. The matter was handed to the Danish branch of IUPAC which, despite this, voted in favour of the name bohrium, and thus the name bohrium for element 107 was recognized internationally in 1997. Bohrium has no stable or naturally-occurring isotopes. Several radioactive isotopes have been synthesized in the laboratory, either by fusing two atoms or by observing the decay of heavier elements. Eleven different isotopes of bohrium have been reported with atomic masses 260–262, 264–267, 270–272, and 274, one of which, bohrium-262, has a known metastable state. All of these decay only through alpha decay, although some unknown bohrium isotopes are predicted to undergo spontaneous fission. The lighter isotopes usually have shorter half-lives; half-lives of under 100 ms for 260Bh, 261Bh, 262Bh, and 262mBh were observed. 264Bh, 265Bh, 266Bh, and 271Bh are more stable at around 1 s, and 267Bh and 272Bh have half-lives of about 10 s. The heaviest isotopes are the most stable, with 270Bh and 274Bh having measured half-lives of about 61 s and 54 s respectively. The unknown isotopes 273Bh and 275Bh are predicted to have even longer half-lives of around 90 minutes and 40 minutes respectively. Before its discovery, 274Bh was also predicted to have a long half-life of 90 minutes, but it was found to have a shorter half-life of only about 54 seconds. The proton-rich isotopes with masses 260, 261, and 262 were directly produced by cold fusion, those with mass 262 and 264 were reported in the decay chains of meitnerium and roentgenium, while the neutron-rich isotopes with masses 265, 266, 267 were created in irradiations of actinide targets. The four most neutron-rich ones with masses 270, 271, 272, and 274 appear in the decay chains of 282Nh, 287Mc, 288Mc, and 294Ts respectively. These eleven isotopes have half-lives ranging from about ten milliseconds for 262mBh to about one minute for 270Bh and 274Bh. 4, analogous to the lighter permanganate, pertechnetate, and perrhenate. Nevertheless, bohrium(VII) is likely to be unstable in aqueous solution, and would probably be easily reduced to the more stable bohrium(IV). Technetium and rhenium are known to form volatile heptoxides M2O7 (M = Tc, Re), so bohrium should also form the volatile oxide Bh2O7. The oxide should dissolve in water to form perbohric acid, HBhO4. Rhenium and technetium form a range of oxyhalides from the halogenation of the oxide. The chlorination of the oxide forms the oxychlorides MO3Cl, so BhO3Cl should be formed in this reaction. Fluorination results in MO3F and MO2F3 for the heavier elements in addition to the rhenium compounds ReOF5 and ReF7. Therefore, oxyfluoride formation for bohrium may help to indicate eka-rhenium properties. Since the oxychlorides are asymmetrical, and they should have increasingly large dipole moments going down the group, they should become less volatile in the order TcO3Cl > ReO3Cl > BhO3Cl: this was experimentally confirmed in 2000 by measuring the enthalpies of adsorption of these three compounds. The values are for TcO3Cl and ReO3Cl are −51 kJ/mol and −61 kJ/mol respectively; the experimental value for BhO3Cl is −77.8 kJ/mol, very close to the theoretically expected value of −78.5 kJ/mol. Bohrium is expected to be a solid under normal conditions and assume a hexagonal close-packed crystal structure (c/a = 1.62), similar to its lighter congener rhenium. It should be a very heavy metal with a density of around 37.1 g/cm3, which would be the third-highest of any of the 118 known elements, lower than only meitnerium (37.4 g/cm3) and hassium (41 g/cm3), the two following elements in the periodic table. In comparison, the densest known element that has had its density measured, osmium, has a density of only 22.61 g/cm3. This results from bohrium's high atomic weight, the lanthanide and actinide contractions, and relativistic effects, although production of enough bohrium to measure this quantity would be impractical, and the sample would quickly decay. The atomic radius of bohrium is expected to be around 128 pm. Due to the relativistic stabilization of the 7s orbital and destabilization of the 6d orbital, the Bh+ ion is predicted to have an electron configuration of [Rn] 5f14 6d4 7s2, giving up a 6d electron instead of a 7s electron, which is the opposite of the behavior of its lighter homologues manganese and technetium. Rhenium, on the other hand, follows its heavier congener bohrium in giving up a 5d electron before a 6s electron, as relativistic effects have become significant by the sixth period, where they cause among other things the yellow color of gold and the low melting point of mercury. The Bh2+ ion is expected to have an electron configuration of [Rn] 5f14 6d3 7s2; in contrast, the Re2+ ion is expected to have a [Xe] 4f14 5d5 configuration, this time analogous to manganese and technetium. The ionic radius of hexacoordinate heptavalent bohrium is expected to be 58 pm (heptavalent manganese, technetium, and rhenium having values of 46, 57, and 53 pm respectively). Pentavalent bohrium should have a larger ionic radius of 83 pm. 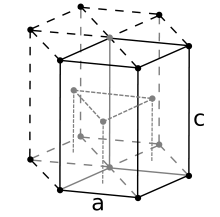 In 1995, the first report on attempted isolation of the element was unsuccessful, prompting new theoretical studies to investigate how best to investigate bohrium (using its lighter homologs technetium and rhenium for comparison) and removing unwanted contaminating elements such as the trivalent actinides, the group 5 elements, and polonium. In 2000, it was confirmed that although relativistic effects are important, bohrium behaves like a typical group 7 element. A team at the Paul Scherrer Institute (PSI) conducted a chemistry reaction using six atoms of 267Bh produced in the reaction between 249Bk and 22Ne ions. The resulting atoms were thermalised and reacted with a HCl/O2 mixture to form a volatile oxychloride. The reaction also produced isotopes of its lighter homologues, technetium (as 108Tc) and rhenium (as 169Re). The isothermal adsorption curves were measured and gave strong evidence for the formation of a volatile oxychloride with properties similar to that of rhenium oxychloride. This placed bohrium as a typical member of group 7. The adsorption enthalpies of the oxychlorides of technetium, rhenium, and bohrium were measured in this experiment, agreeing very well with the theoretical predictions and implying a sequence of decreasing oxychloride volatility down group 7 of TcO3Cl > ReO3Cl > BhO3Cl. 1 2 3 4 5 6 7 8 9 10 11 12 Hoffman, Darleane C.; Lee, Diana M.; Pershina, Valeria (2006). "Transactinides and the future elements". In Morss; Edelstein, Norman M.; Fuger, Jean. The Chemistry of the Actinide and Transactinide Elements (3rd ed.). Dordrecht, The Netherlands: Springer Science+Business Media. ISBN 1-4020-3555-1. 1 2 3 Östlin, A.; Vitos, L. (2011). "First-principles calculation of the structural stability of 6d transition metals". Physical Review B. 84 (11). Bibcode:2011PhRvB..84k3104O. doi:10.1103/PhysRevB.84.113104. 1 2 3 Fricke, Burkhard (1975). "Superheavy elements: a prediction of their chemical and physical properties". Recent Impact of Physics on Inorganic Chemistry. 21: 89–144. doi:10.1007/BFb0116498. Retrieved 4 October 2013. 1 2 FUSHE (2012). "Synthesis of SH-nuclei" (PDF). Retrieved August 12, 2016. ↑ Yu. Ts. Oganessian et al. On spontaneous fission of neutron-deficient isotopes of elements 103, 105 and 107 // Nuclear Physics A. — 1976. — Т. 273. — № 2. — С. 505-522. 1 2 Barber, R. C.; Greenwood, N.N. ; Hrynkiewicz, A.Z. ; Jeannin, Y.P. ; Lefort, M.; Sakai, M.; Ulehla, I.; Wapstra, A.P. ; Wilkinson, D.H. (1993). "Discovery of the transfermium elements. Part II: Introduction to discovery profiles. Part III: Discovery profiles of the transfermium elements". Pure and Applied Chemistry. 65 (8): 1757. doi:10.1351/pac199365081757. 1 2 3 Münzenberg, G.; Hofmann, S.; Heßberger, F.P. ; Reisdorf, W.; Schmidt, K.H. ; Schneider, J.H.R. ; Armbruster, P.; Sahm, C.C. ; Thuma, B. (1981). "Identification of element 107 by α correlation chains" (PDF). Zeitschrift für Physik A. 300 (1): 107–8. Bibcode:1981ZPhyA.300..107M. doi:10.1007/BF01412623. Retrieved 19 November 2012. ↑ Ghiorso, A.; Seaborg, G.T. ; Organessian, Yu. Ts. ; Zvara, I.; Armbruster, P.; Hessberger, F.P. ; Hofmann, S.; Leino, M.; Munzenberg, G.; Reisdorf, W.; Schmidt, K.-H. (1993). "Responses on 'Discovery of the transfermium elements' by Lawrence Berkeley Laboratory, California; Joint Institute for Nuclear Research, Dubna; and Gesellschaft fur Schwerionenforschung, Darmstadt followed by reply to responses by the Transfermium Working Group". Pure and Applied Chemistry. 65 (8): 1815–1824. doi:10.1351/pac199365081815. 1 2 3 "Names and symbols of transfermium elements (IUPAC Recommendations 1997)". Pure and Applied Chemistry. 69 (12): 2471. 1997. doi:10.1351/pac199769122471. ↑ "Names and symbols of transfermium elements (IUPAC Recommendations 1994)". Pure and Applied Chemistry. 66 (12): 2419. 1994. doi:10.1351/pac199466122419. 1 2 3 4 Sonzogni, Alejandro. "Interactive Chart of Nuclides". National Nuclear Data Center: Brookhaven National Laboratory. Retrieved 2008-06-06. 1 2 Gray, Theodore (2002–2010). "The Photographic Periodic Table of the Elements". periodictable.com. Retrieved 16 November 2012. ↑ Nelson, S.; Gregorich, K.; Dragojević, I.; Garcia, M.; Gates, J.; Sudowe, R.; Nitsche, H. (2008). "Lightest Isotope of Bh Produced via the Bi209(Cr52,n)Bh260 Reaction". Physical Review Letters. 100 (2). Bibcode:2008PhRvL.100b2501N. doi:10.1103/PhysRevLett.100.022501. ↑ Münzenberg, G.; Armbruster, P.; Hofmann, S.; Heßberger, F. P.; Folger, H.; Keller, J. G.; Ninov, V.; Poppensieker, K.; et al. (1989). "Element 107". Zeitschrift für Physik A. 333 (2): 163. Bibcode:1989ZPhyA.333..163M. doi:10.1007/BF01565147. ↑ Hofmann, S.; Ninov, V.; Heßberger, F. P.; Armbruster, P.; Folger, H.; Münzenberg, G.; Schött, H. J.; Popeko, A. G.; Yeremin, A. V.; Andreyev, A. N.; Saro, S.; Janik, R.; Leino, M. (1995). "The new element 111" (PDF). Zeitschrift für Physik A. 350 (4): 281. Bibcode:1995ZPhyA.350..281H. doi:10.1007/BF01291182. ↑ Gan, Z.G. ; Guo, J.S. ; Wu, X. L.; Qin, Z.; Fan, H.M.; Lei, X.G. ; Liu, H.Y. ; Guo, B.; et al. (2004). "New isotope 265Bh". The European Physical Journal A. 20 (3): 385. Bibcode:2004EPJA...20..385G. doi:10.1140/epja/i2004-10020-2. 1 2 Wilk, P. A.; Gregorich, KE; Turler, A; Laue, CA; Eichler, R; Ninov V, V; Adams, JL; Kirbach, UW; et al. (2000). "Evidence for New Isotopes of Element 107: 266Bh and 267Bh". Physical Review Letters. 85 (13): 2697–700. Bibcode:2000PhRvL..85.2697W. doi:10.1103/PhysRevLett.85.2697. PMID 10991211. ↑ Malmbeck, R.; Skarnemark, G.; Alstad, J.; Fure, K.; Johansson, M.; Omtvedt, J. P. (2000). "Chemical Separation Procedure Proposed for Studies of Bohrium". Journal of Radioanalytical and Nuclear Chemistry. 246 (2): 349. doi:10.1023/A:1006791027906. ↑ Gäggeler, H. W.; Eichler, R.; Brüchle, W.; Dressler, R.; Düllmann, Ch.E. ; Eichler, B.; Gregorich, K. E.; Hoffman, D. C.; et al. (2000). "Chemical characterization of bohrium (element 107)". Nature. 407 (6800): 63–5. doi:10.1038/35024044. PMID 10993071.